These phrases get echoed a great deal for a variety of reasons but, when it comes to travel, truer words may have never been spoken. The travel bug can bite at any time, and when it does, you need to embrace it. Take the weekend getaway; Explore that destination you’ve been dreaming of for years; Eat that crazy dish that others might be afraid of. All of these things can revitalize you in unimaginable ways if you just take that initial step to get out and travel. 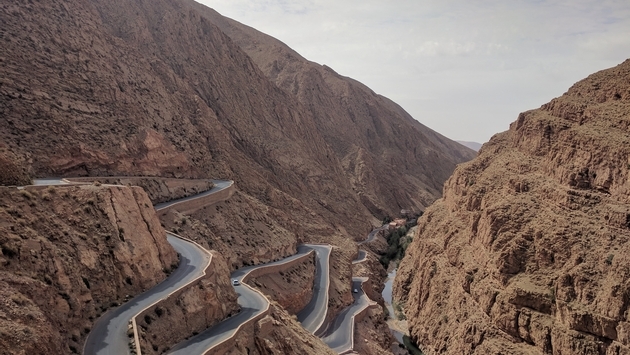 I recently ventured on a nine-day journey across Morocco. It was my first time visiting Africa and experiencing a completely new culture. I was excited to make lifelong memories, but little did I know just how much I would step outside my comfort zone. It’s amazing the power that traveling can have on a person. On a group tour with G Adventures, we traversed the desert and mountains. Along the way, I would end up experiencing numerous firsts. My first time riding a camel, my first time standing on the ledge over a massive gorge, my first time eating goat, sheep’s head and sheep’s tongue and the first (and probably last) time hanging a snake around my neck. Prior to leaving the trip, I didn’t plan for any of these to happen. The camel ride wasn’t included as a part of our tour. It was a spontaneous event our group decided on together. It was something that had to happen, even for those who were nervous about venturing out into the desert on the back of a (sometimes unpredictable) large animal. Thankfully, nobody got spit on! Not only had none of us ridden a camel before, some of us may never get the chance to do it again. The chance to partake in the adventure opened up, and we all jumped at it. At the end of the tour, everyone stated the camel ride was a top moment for them. And to think, it may have never happened if we didn’t voice our desires to try something new during our journey. Goat is a dish sampled by many in the desert, and I told myself I needed to eat something new on this trip. I needed to not be afraid and to just go for it. As it turns out, I actually enjoyed the dish! It was a bit chewy, but the meat had great flavor and, if given the chance, I would likely eat it again. Traveling is all about experiencing new things, and I was on a roll here for checking stuff off my "I’ve never done this before" list. I didn’t much care for the head or the tongue, as it was a bit bland (it needed some hot sauce or spices), but it’s an awesome story I can carry with me forever. The snake charmer we met in the desert was an old man with an infectious laugh. He wanted us to put the snake around our neck and pose for a picture, but everyone was quite hesitant. After one brave soul stepped forward, many followed, including me. Seeing others step outside of their comfort zone made me want to do the same. Will I ever put a snake around my neck again? I think I just might, if given the chance to do so in a unique environment. And I owe it all to travel. Trying new things and stepping outside of your comfort zone doesn’t have to be only when you leave the country. Take that long road trip and eat lunch off the beaten path; Ride that scary big roller coaster at the theme park; Taste that strange dish at the local fair. Don’t be afraid of the travel bug. We live in a beautiful world. Go out and explore it!